EX-Center is for anyone who has multiple limb deficiencies, such as people with Dysmelia (congenital reductive malformations), Thalidomide victims and arm and/or leg amputees. Amputation reasons may be severe burns, war injuries or blood poisoning (sepsis). EX-Center works with habilitation, rehabilitation, and health from an all-inclusive perspective, as well as with knowledge-developing efforts and information dissemination, in conformity with the Swedish Handicap Reform. Our overall goal is to give persons with multiple limb deficiencies opportunities to themselves actively work toward living as independent a life as possible, given their individual capacities. EX-Center’s aim is to give every patient increased health and quality of life. In order to reach this goal, the patient takes part in the planning of his/her rehabilitation, which allows the team at EX-Center to individualise and design the rehabilitation according to the patient’s own wishes and priorities. Our organisation is always learning. EX-Center will contribute to research in the area of multiple limb deficiencies, and we will integrate research and research results in our activities. We will also cooperate regularly with other national and international centres for information exchange and development. EX-Center’s area of responsibility is rehabilitation for people with multiple limb deficiencies. This includes people with congenital multiple limb deficiencies (including dysmelia, TAR syndrome, Arthrogryposis, and Aperts syndrome), Thalidomide effects, as well as acquired multiple limb deficiencies caused by trauma or disease (such as sepsis or tumours). Dysmelia can be described as lacking an arm, a leg, or a part thereof. In Greek ”dys” means abnormal, and ”meli” means limb; thus it means ”abnormal limb”. Dysmelia is a congenital injury, a limb reduction deficiency, on one or more limbs. Limb reduction deficiency means that parts of arms or legs are missing. The transversal type is a straight, amputation-like injury, and the longitudinal is just that – a longitudinal injury. For example, a lengthwise bone may be missing, but there are other bones remaining adjacent or below. The reason for dysmelia deficiencies is usually unknown. The causes may in fact be varying. The occurrence of dysmelia is relatively constant. Annually about 60 children are born with dysmelia. Of these, about 15 have only minor finger or toe injuries. The rest have deformities of their hands or feet and upward. In general, two thirds of the injuries affect arms, and one third affect legs. Every year, about two children are born with multiple limb deficiencies. More than 50 years ago, a West German paediatrician sent out an alarm that a much-prescribed and supposedly totally harmless sleeping pill was the cause of a wave of serious malformations in new-borns in West Germany. In Sweden this product was sold under the name of Neurosedyn. When the extent of the catastrophe was finally known, it became evident that about 10,000 children in the world were born with deformities caused by this medication. 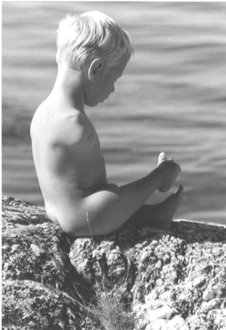 In Sweden between 150 and 160 children were born with Thalidomide effects, of which about 35 percent died at birth, often due to deformities of the heart or kidneys. Of the 107 children who survived, many had skeletal deformities. The active ingredient in the medicine, thalidomide, blocks the growth of long cortical bones, which causes hands and feet to be able to grow directly from the torso, without arms or legs in between. Many children were also born with internal deformities as well as with vision or hearing injuries. An accident or illness can lead to amputation of limbs. The reason may for instance be very severe burns, war injuries or blood poisoning. Blood poisoning, also known as sepsis, is a bacterial infection that causes tissue damage and in severe cases can lead to amputation of several limbs. Aperts syndrome or Acrocephalosyndactylia type 1 are collective names for a number of deformities of the cranium, the facial skeleton and the hands and feet. Other skeletal deformities are frequent, as are reduced mobility in the joints, disequilibrium, breathing difficulties, vision and hearing problems, as well as cleft palate and jaw and tooth problems. The mental capacities vary from normal to underachieving. Developmental disabilities can occur. Most people are, however, of normal intelligence although they can be subjected to such great stress that certain skills cannot be developed at their normal rate. The individual variations between symptoms and degrees of difficulty in people who share this diagnosis are great. TAR syndrome is characterised by a combination of a low level of thrombocytes and the absence of the radius bones in the lower arms. The name TAR is made up of the first letters in the words thrombocytopenia (lack of thrombocytes), and absence of radius (one of the bones in the lower arm). The characteristic lack of the radius in both lower arms is visible at birth. This causes the lower arms to be very short, and the hands are often bent at an angle in relation to the upper arms. Affected children can also have other changes in the musculoskeletal structures of the arms and hands, for example underdevelopment or changes of the other lower arm bone (the ulna), changes or reductions in the upper arm bone, or skeletal deviations in the hands. In approximately half there are also skeletal changes in the legs and feet. The knees can be malpositioned and the kneecaps can be located incorrectly. The knee joints are often unstable, which can cause bowleggedness or knock-kneedness. The hip joints can be dislocated (dysplasia of the hip). The number of children with TAR syndrome is very low. Only one or two children are born with this syndrome in Sweden every year. Arthrogrypos or AMC (Arthrogryposis Multiplex Congenita) is a syndrome with congenital malpositioning in several joints. Stiffness and contractures can affect jaw, shoulder, elbow, knee and ankle joints. The malpositioning is combined with more or less extensive muscle weakness. The range of the functional disability varies from relatively slight to very serious disability. Treatment comprises plastering, orthotics, physiotherapy, and/or operations with the purpose of attaining as good a posture and function as possible. AMC can be caused by illness or injuries in the nervous system, the muscles, or the skeleton/joints, or by mechanical causes. In an average year about five children in Sweden are born with this diagnosis. There are about 350 people of varying ages in the country with this disability.